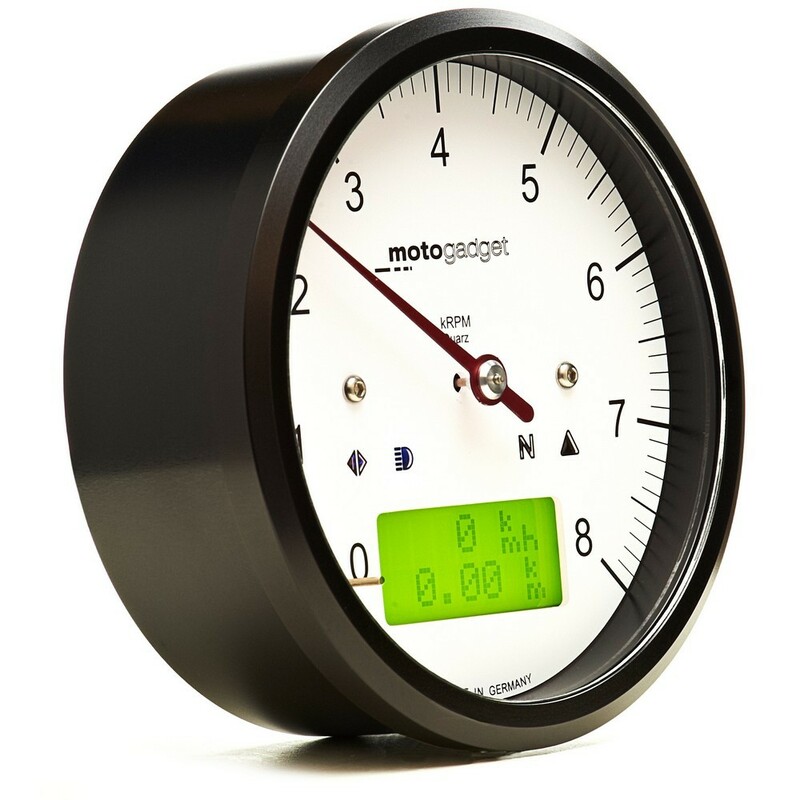 The motoscope classic from motogadget is a digital multi-purpose instrument with a classic round casing. A white dial and a red indicator driven by a precision stepper motor comprise the analogue rev counter. 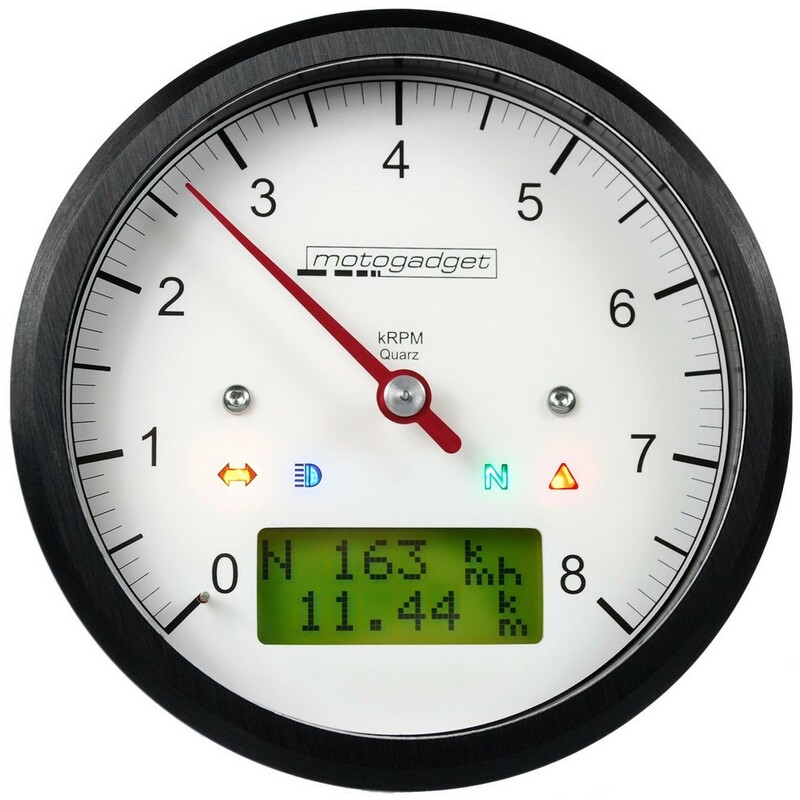 The LC display and four indicator LEDs display the numerous features exactly and reliably. The design goes well with every type of mod or original machine - regardless if real classic, youngtimer, custom or sports bike. The motoscope classic is equally suited for sports or kit cars. High end materials, assembly by hand and our scrupulous quality control provide the highest possible quality in functionality and looks. The high quality aluminium casing is turned and machined from the block with CNC technology. The surface is brushed first and later anodized in black or natural aluminium. The casing is 100% water-tight. The viewing glass is made from scratch-proof special plastic. The widely used 80-mm-dimensions allow for easy replacement of the original instruments. The readability of the engine speed is optimal due to the red indicator on the white dial. The innovative, completely illuminated background surface is used to the fullest possible extend. A precise and vibration free rev counter display by the stepper motor driven indicator is achieved by a fully adjustable gear ratio and a dampened indicator. The LC display stays readable and illuminated even if in direct sunlight. Four ultra bright indicator LEDs complete the instrument. The red LED acts as warning light when reaching the set threshold for rpm, temperatures (min./max. ), pressure readings (min./max. ), vehicle voltage and the oil pressure switch or similar connected transmitting devices. Different warnings are easily distinguished by different blinking patterns or continuous lighting. Display pages of the LCD display are swapped via the menu and headlight flasher push-buttons. The first line always indicates speed. 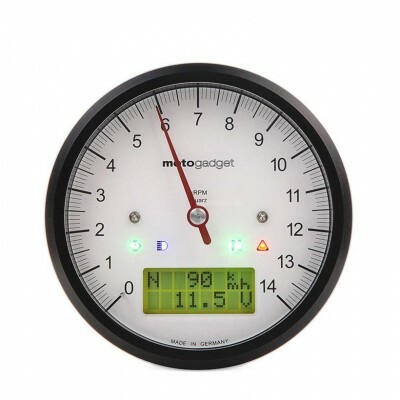 Additional measurements can be displayed if needed by pushing a button. Default settings or saved values will of course be preserved in the memory even if the power is cut. The widely used mounting diameter provides adaptivity to many vehicle platforms. We provide for optional mounting hardware. Refer to 'Mounting'. The connector cable is approx. 55 cm long and the connectors are already pre-installed on the instrument side. Matching counter parts for the vehicle side are included. The engine speed measurement input is easily connected to the ignition coil or ignition box. 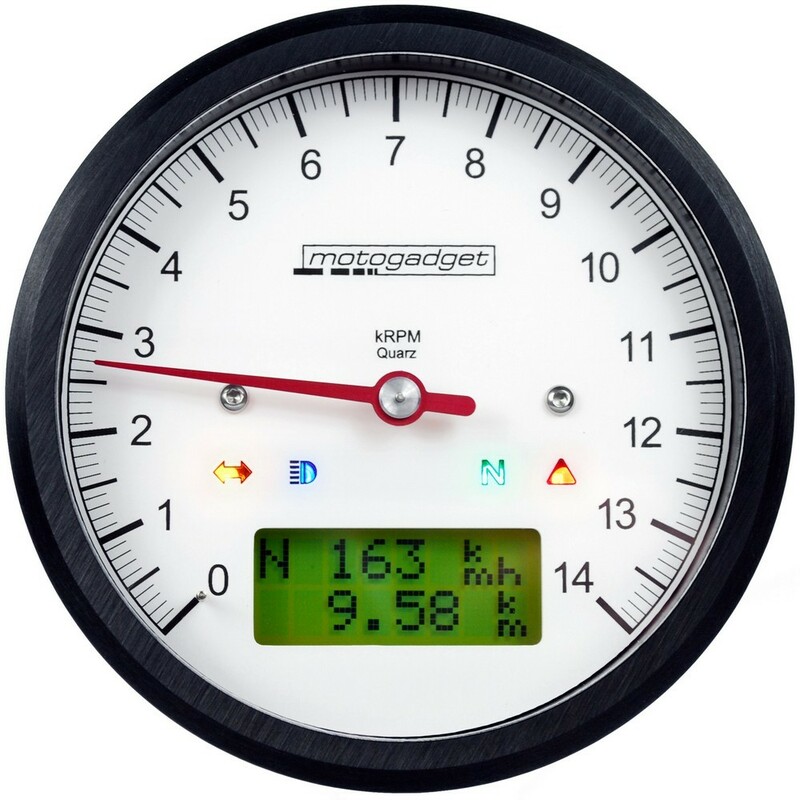 The included stainless steel speedometer sensor is small (M5/22 mm) and effortlessly connected to the front or rear wheel by the 1.5 m connector cable. We provide appropriate sensors for optimal measurements of air, oil and water temperature as well as oil pressure (refer to 'Accessories'). 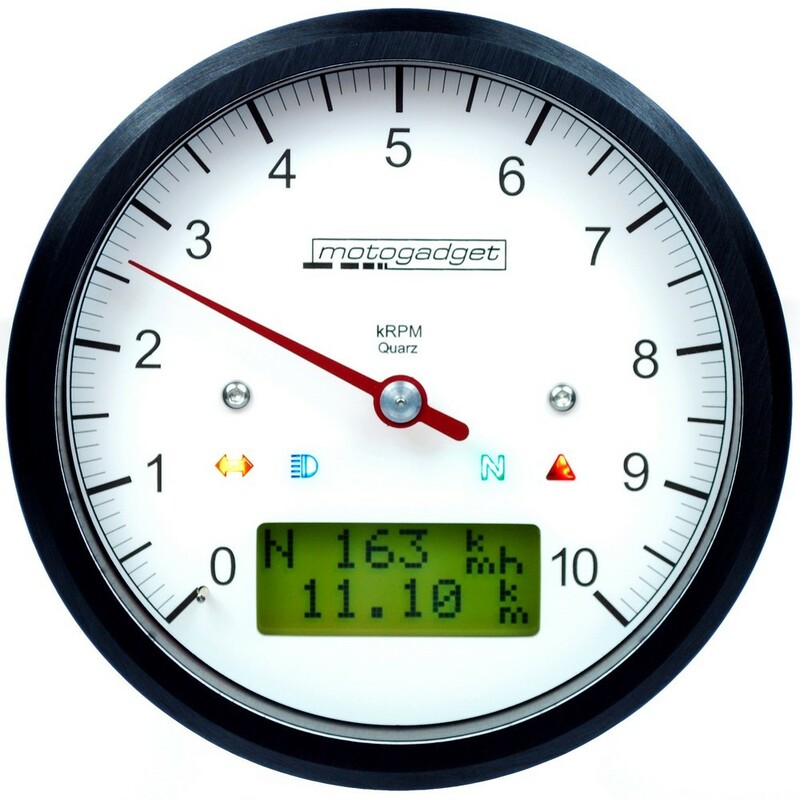 A technically identical instrument with a black dial (refer to 'Chronoclassic') or configured as analogue speedometer (refer to analogue speedometer series CLASSIC) is also available. Please note that temperature and pressure sensors have to be ordered separately (refer to 'Accessories').